Challenge yourself with New Zealand Heli skiing in Wanaka. This form of skiing is designed for those who dare to go extreme and want an adventure that they will never forget. Heli skiing is skiing that is downhill but the catch is that there is no chair lift. 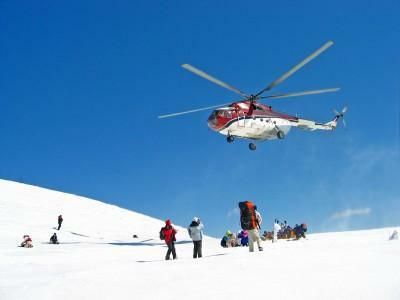 The slopes are accessed by helicopter only. Skiers unload from the helicopter and hit the slopes from the air. This form of skiing has its risks and is not meant for those who are beginners. One of the biggest risks of heli skiing is avalanches. Many skiers who try heli skiing never go back to the traditional lifts. Wanaka, New Zealand is well-known for its outstanding scenery and picturesque views. It is located close to Queenstown and is home to what some say is the best heli skiing in the world. Heli ski season is from July to the end of September. Alpine Heli-ski offers several heli skiing options. Regular packages range from three to eight day runs. Private charter options for a half to a full day of skiing with a private Eurocopter are also available for small groups. Friendly guides give a full safety briefing before you begin, and a gourmet lunch is included. A guide will take you to the best locations and conditions that the mountain has to offer. The terrain spans eight mountain ranges, including Mt. Cook, the highest mountain in New Zealand. Southern Lakes Heliski & Heliworks gives group tours as well as offers heli skiing. They have been operating heli skiing for over 20 years and have experienced guides and pilots. Groups of five or less people are taken skiing on pristine mountains. The terrain of the day depends on the weather and the skiers' abilities as well as the snow conditions on the mountains. A lunch is provided to skiers as well as transportation between your lodging and the staging area. Harris Mountains has packages including those for heli skiing. Packages start out for skiing three runs but can include more runs for an additional cost. Lunch and safety equipment are included in the packages and video of the day can be done if requested ahead of time. Harris Mountains offers a variety of runs from those in the sun to those in the shade. They have a wide range of skiable areas to choose from making them one of the top operators for heli skiing. So once you decide that you want to try heli skiing, do you know what to take with you for the day? Obviously, space is limited on a helicopter so there is a limit what to take. Your best option is to store your necessities in the pockets of your pants and jacket or to take a waist pack with you. Most heli skiing operators will provide you with the necessary safety equipment as well as provide a lunch, so don't worry about those items.